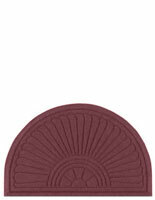 These 6 x 10 maroon entry mats have a fashionable fabric border and rounded edges with a floral pattern. Each carpet is great for both homes, stores and lobbies because they are made of absorbent and slip resistant polypropylene fiber. 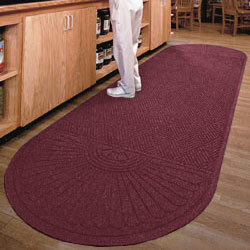 This type of maroon entry mat will soak up mud and water and can easily be cleaned with a vacuum cleaner or a hose. The lobby rugs are additionally anti-static rated at 1.2KV by the AATCC and Certified Slip Resistant by the National Floor Safety Institute. 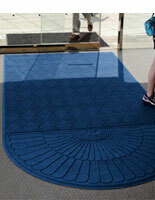 The entry mats made of slip resistant fiber with a pile height of 0.375". 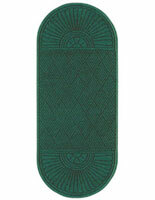 Also available are carpets with a blue, green or gray fabric.